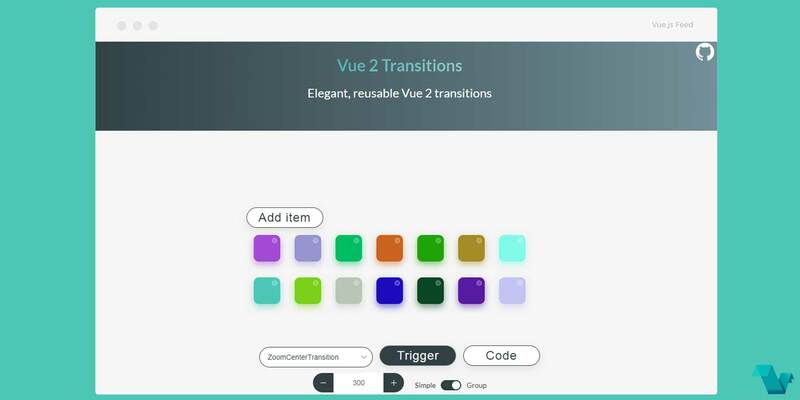 The transitions components Vue 2 Transitions for Vue.js allows you to create transitions in various ways, utilizing this configurable collection. Each transition component has ~2kb (non-minified js+css or ~400 bytes gzipped) and you can import only the ones you really need. Many alternative solutions import the whole animate.css library. Vue2-transitions is minimalistic and lets you import only the transitions that you need in your app. * Whether the component should be a `transition-group` component. *  Transform origin property https://tympanus.net/codrops/css_reference/transform-origin/. Each transition can be used as a transition-group by adding the group prop to one of the desired transitions. If you want to configure the duration, just redefine the class for the transition you use with the desired duration. To start working with the Vue Swiper use the following command(s) to install it. The above markup is an example of a ScaleTransition. That's it! If you would like to get started with Vue Transitions, head to the project's repository on GitHub, where you will also find the source code.